You might have seen this quote on my Facebook page – truly words to live by! 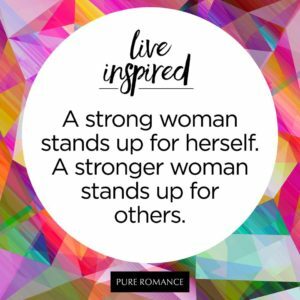 Since launching Pure Romance more than three decades ago, there were many times that I could have given up…could have let negativity or fear stop me or stand in my way. That was never an option. I knew that there was always one more woman who needed a voice – needed someone to give them permission to speak honestly about sexuality – needed to be empowered. Empowerment is not a one-woman show. It grows stronger when you are able to lean on your friends, family and sister Consultants – especially when challenged. I should add, when it comes to any cause worth fighting for, you will be challenged. Many women have asked me how I overcame obstacles and remained unstoppable throughout the years. Here are just a few tips from years of experience working in this industry! The pink elephant in the room. We address a topic that is still wrapped in stigma. There will always be someone who is going to be negative about this business. It’s nothing new. Many advocates throughout history have challenged the status quo; do you think Madonna would have had the same effect on the world if she let others stop her from Expressing Herself? Stigmas and negativity never stood in my way. I was doing this for the betterment of women and knew that women needed to make decisions about their sexuality within their very own bedrooms. The most negative people are often the least educated on what Pure Romance is truly about. That’s why we have to push further. Dealing with let downs or disappointment. Regardless of what you do for a living, there will always be disappointments in your work and personal life. Pure Romance Consultants reading this know what it feels like to have a party cancelled or show up to a party with only two people in the room. I tried to look at every negative experience as an opportunity. Sometimes, I found I had better sales when I had a small showing versus a packed house! Not to mention, one of those two guests could end up joining your team as a Consultant. Take a negative and turn it into a positive. That’s when you’re truly unstoppable. Creating your own opportunities! I’ve heard Consultants say things like, “I can never book a party.” Most of the time this is because they aren’t talking about it to others, or showing their enthusiasm about their business. The more you surround yourself with other Consultants, use the online training classes, and show up at local team meetings in your city, the more enthusiastic you will be about your business. Consultants who educate themselves are more confident and fearless when it comes to sharing Pure Romance with others. I was so proud looking out at all of the faces at National Training last month. Everyone was so positive and hungry for more knowledge. Each Consultant came from near and far to learn more so they could ultimately lift others up and bring that same positivity into their lives. Those ladies truly get it! In just a few weeks, we will connect with all of you again during our Pure Romance Unstoppable Bus Tour September 14th – October 27th. I am so excited to be visiting some of your cities and hearing your stories this Fall. Our team is bringing the training to you across the country to reconnect with our Consultants and remind them that they, too, are unstoppable on this mission to stand up for other women and change the lives of women.